FIRST Flight Wind, a consortium comprising B9 Energy, DONG Energy and RES, has hosted its second Shipping and Navigation Working Group meeting at the Whistledown Hotel in Warrenpoint. The consultation process with stakeholders in the marine environment is still on-going for the proposed windfarm development off the County Down coast where a possible 200-300 wind turbines may be located. 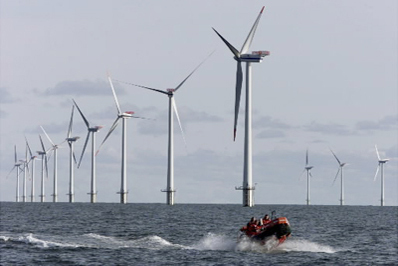 This Working Group is one of six which have been established to help First Flight Wind assess the potential impacts of an offshore wind farm on key industries. Consultations are ongoing between marine stakeholders and First Flight Wind. Made up of 13 individuals, members of this Working Group are a mix of individual specialists, or represent relevant organisations and statutory bodies such as Warrenpoint Harbour Authority, ferry companies and the Department of the Environment. Individuals can also participate in the Working Group regardless of their views on the project. Gavin Clark of First Flight Wind said: “It is important for us to have a forum for the discussion of issues relevant to the potential impacts of this project on shipping routes and activities within the Wind Resource Zone. The participants can advise us on technical matters relating to our environmental impact assessment, and we can update them on progress with the project’s development. Other areas of discussion at the Working Group included ongoing survey work within the Wind Resource Zone; the metocean survey which allows First Flight Wind to collect wave, current, sediment, salinity and temperature data over a period of two years commenced in November. Two metocean buoys were deployed at different locations within the Wind Resource Zone with marker buoys to alert marine traffic in the area. “The Metocean buoys were deployed by Strangford Moorings, a family business located in Strangford Lough running for 20 years and working off the east coast of Northern Ireland. Their vessel, the MPV Skua, was used with support from Fugro EMU, a leading UK marine survey and environmental consultancy specialist. The Working Group discussed how best to issue Notices to Mariners, so that users of the sea are aware of survey vessels, locations and timescales.